So first up, the Chile- Peru border. It was very efficient actually for what is a bit of a bitty journey. First from Arica we took what they call a ´taxi collective´ to Tacna, i.e. a 5 person car which has to be filled before it heads off across the border. Bus´s can´t cross the border Chile to Peru so that’s why you need to catch a taxi. You get them from the international terminal right next door to the bus terminal in Arica. So in ours we had 3 locals and all the drivers know exactly what to do so we felt quite looked after. So after 20 minutes travelling we arrived at the first immigration point and got our passports stamped out of Chile. Then it was back in the taxi for 2 minutes before getting out again to get stamped into Peru (I still wonder who that strip of land in-between belongs too!). And also to have our bags scanned. Then back in the taxi again for 40 mins or so until we arrived in the first city across the border in Peru called Tacna. In Tacna, its similar to Arica- the bus terminal is just next door to where you get dropped off across a small road. We had already bought our onward bus ticket which we had in our hands leaving the taxi and soon got swept up from a rep from the bus company who took us to a waited room and then onto the bus. 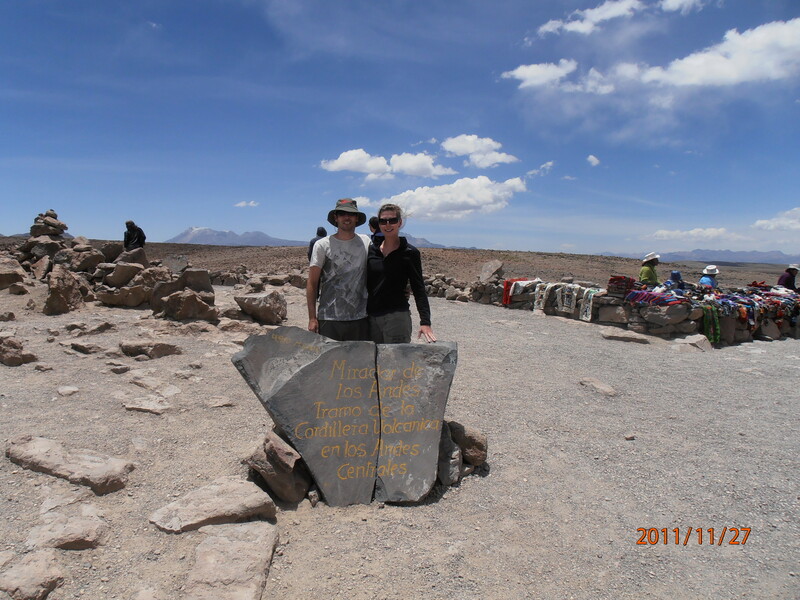 The bus company we went with was called Transportes Ariquipa…not 1 of the companies recommended for travellers we later discovered and we can vouch for that! It was an incredibly uncomfortable 6 1/2 hour journey with no air con and stopping in very random places to pick up very random looking people! But it was an experience and we got to our final destination, Ariquipa, in one piece so no harm done! There´s quite dodgy taxi´s in Ariquipa and there´s lots of signs in the bus terminal to get a taxi from those inside the terminal not on the street so we took heed to the advice and caught a 5 sol taxi to our hostel- La Casa de los Pinguinos. Phew what a day! I have nothing but good things to say about La Casa de los Pinguinos, and the owner, from Amsterdam originally, called Alex can´t do enough for you. Plus she used to live in Princetown for 3 years (right near where I grew up in Plymouth) so we reminisced about the various night spots (Union street!) and tors on Dartmoor which was a nice bit of familiarity. Ariquipa has a lovely feel to it. The main plaza is surrounded by colonial building with cover walk ways, on one side a massive Cathedral and in the middle gardens and a fountain. It wouldn´t have looked out-of-place in a European Capital City. That evening after the border crossing we pretty much found food and hit the sack. However Peru is 2 hours behind Chile which I really discovered the next morning when I was wide awake at 6am- my body thinking it was 8am. To my delight (Hedd´s horror!) I found the film Ratatouille on the Disney channel and watched that until it was a more godly hour! That Saturday was filled with seeing the sights of the city. First stop, Museo Santuarios Andinos (15 soles entry). The museum is all about the Inca children sacrifices that were made on the highest mountain surrounding Ariquipa called Ampato. It started out with a 20 mins National Geographic film about the discovery of the graves on top of the mountain (by accident by a group of geologists!) and then a guided tour of the exhibitions and ended with seeing the actual frozen body of one of the 4 children they found on Ampato. So the story goes that the Inca´s 500 years ago saw the mountains as their gods. And whenever there was a natural disaster or volcanic eruption the Inca people took the 3 to 4 month journey by foot from Cusco to Mount Ampata to make a child sacrifice to the gods so to appease their anger and didn´t bring natural disasters to the area again. The children were chosen at birth and were all sacrificed by the time they were 16. There is a really famous one called the íce maiden´which when found was perfectly preserved due to the low temperatures at the top of the mountain, only a lot smaller as she had shrunk over the 500 years 6288 meters up. Kind of freaky looking! We then took a taxi (5 soles) up to Mirador de Yanahuara to get a great view of Mount Mismi- the active volcano that Ariquipa wraps itself around. And then strolled back down to the main Plaza, stopping off for lunch at a traditional Peruvian restaurant called Sol de Mayo where you sit in a lovely garden and eat whilst listening to a live band playing Peruvian folk tunes. Very lovely and not super expensive either. We had the infamous Recodo Rellero- a hot pepper stuffed with meat and topped with cheese. We stopped short of trying the other infamous dish- roasted guinea pig! After a siesta we headed back out to the Plaza to check out the big cathedral (open 7am-11am and 17.00-19.30). Although it occupies one whole side of the square, its surprising small inside but it was worth a peek in. And then it was an early night in prep for the early rise the next day to start our tour of Canon del Colca. So Canon del Colca. 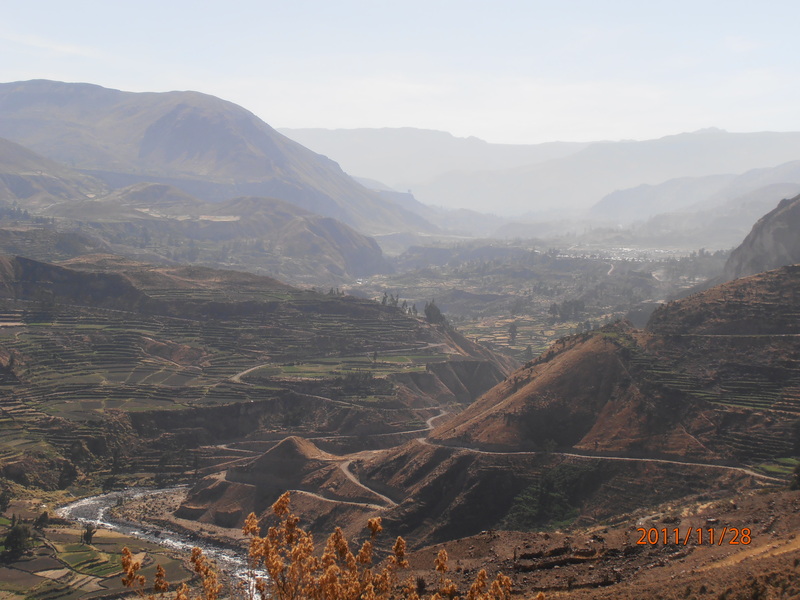 It’s still within the Ariquipa district but around a 3 hour drive from Ariquipa city and much higher so its worth if you have time, to take the tour over 2 or more days so you can acclimatize to the altitude. We went on a 2 day 1 night tour, starting off at 7.30am from our hostel. Our tour guide was called Nancy and we were a small group of 12 so didn´t feel so touristy and impersonal. So it was a 3 hour drive to Chivay which was our overnight stop but the drive was separated out with stops at nice view points and to see the Vicona´s (long-necked lamas), Lama´s and Alpacas…all extremely cute looking, especially the babies. At most of the stops there were ladies dressed up in the colourful traditional costume selling all sorts of souvenirs (clothing made from alpaca wool, bright patterned fabrics, figurines) but they looked so so fantastic. They wear highly embroided skirts and waistcoats, with silk blouses underneath and colourful shawls over the top. And all topped off with a great hat. Peruvian ladies know how to wear their hats…i´m quite jealous! There is a story about these hats too. There are 2 different types. 1- flat-topped and wide and highly embroided, and the second a white taller hat with sequins on it. They represent the 2 different ethnic groups from the Inca times 500 years ago and the hats back in the day were a way of discretely saying which group the lady belonged too after the Spanish had invaded and conquered the Incas and band most of their traditions. History or not, both hats are stunning. After lunch and a siesta (getting used to these afternoon naps now!) we got picked up from our hostel in Chivay and headed to the near by natural hot springs. It cost 15 soles to get in but it was well worth it. The pools are in the open air with mountains as their backdrop. The one we were in was 38 degrees with natural minerals in it and so so relaxing. It is recommended you only stay in the pools for a maximum of 40 minutes because of the effect of the minerals, heat and altitude. And its was true that when we came out we felt content but completely wiped out! So it was back to the hostel for a shower and an early dinner. The next day we had our wake up call of a bang on the door at 5am, for breakfast at 5.30 and back on the mini bus for 6am….one word, ouch! The reason for the crazy early start was to get to the Cruz del Condor viewpoint within Colca Canyon for around 9am when it was more likely to see Condors. On the way to the Canyon we passed through Colca Valley and stopped off at various valley towns on the way. This included Yanque where at 6.30am there were Peruvian dancers in traditional costume in the square dancing round and round to remarkably loud music which left us quite stunned and we took sanctuary in the church. The Peruvian´s love gold leaf in their churches, and the backdrop of the alters are floor to ceiling gold leaf in most of the churches I´ve been in…very elaborate. Then it was onto Achoma, and then onto Maca which is apparently sliding gradually into the river due to tectonic plate activity underneath it…bad times. All through the drive we got a great view of the Inca terraces- the tiered agricultural system following the contours of the mountains. They made them by removing the soil, then putting a layer of rock, then small stones, then sand, then soil with irrigation channels weaving throughout the tiers. It’s a really impressive sight to see. The Inca´s were the engineers of their time and they carved terrace prototypes in stone before starting on the mountain for real. These prototypes are still dotted around the valley today and if you pour water in the pool at the top then the water will run down the carved prototype as it does on the actual terraces which are still being farmed today. Very clever and very cool! So we got to the Canyon at around 9.30am and went on a bit of a trek to the viewing platforms instead of driving so we could get a better look at the Canyon. Colca Canyon is the deepest canyon in the world…even deeper than the Gran Canyon in the states. But instead of a U shape at the bottom like the Gran Canyon its in the shape of a V. Around 60 condors live in the canyon but we only saw 4 during our 60 minutes at Cruz del Condor. We didn´t see many because it is the start of the rainy season and condors don´t fly, they glide using the thermal currents. In the rainy season the thermal currents aren´t so prevalent as it’s not so hot, therefore not as many condors. But we got to see 4 so not so bad. And then it was onto Chivay again for lunch before making the 3 hour drive back to Ariquipa city. The roads are incredibly windy but I still managed to sleep even if Hedd and I bashed heads a couple of times from the bends! Although we´d already been up 12 hours by the time we got back to Ariqupa that Monday, our day wasn´t over! That night we caught the overnight bus to Cusco. This time going with a recommended bus company called Cruz del Sur! And it was a much more pleasant journey, with yet another Jennifer Anniston rom com movie for entertainment, this one called ´Rumour´. The bus journey took 10 hours and we arrived into Cusco at 7.30am and after a 4 sole taxi, we got to our hostel in time to catch free breakfast. Our hostel is called Ecopackers and is just 2 blocks from the main square- Plaza de Armas. Amazing location. The hostel is the biggest we´ve stayed in and has 18 person dorms! Must be a nightmare trying to get to sleep in those! They also have a Christmas tree with fairy lights up in the foyer which has made me very happy over our 3 days here! Cusco is a great city, has lots of pretty squares with restaurants with balconies overlooking them. Lots of places to just sit and chill and watch the world go by. Our 3 days here in Cusco have really been to get acclimatised for our Inca trek and buy any last-minute bits for it. For me this was socks! Gotta look after your feet when walking, first rule of D of E! But yesterday we did go on a free walking tour of Cusco which runs each day from Ecopackers at 11.30am. Its well worth the 3 hours, and the guide (sense of humour comes free also!) takes you to the old town, the tourist centre and the bohemian part of the city. As well as into the Chocolate Museum (where we got a free chocolate tea- looks like tea, tastes like hot chocolate), stopping for a free frapichino at Cusco Coffee Bar and ending at a really cool bar called Fallen Angel. Everywhere you go you get a 10% off voucher so you can go back on the cheap later on. It was during the tour I had my first peculiar altitude sickness moment where I almost fainted but don´t worry after a bit of water and a sit down I was fine. The guide also showed us the hotel where Mick Jagger and his family had stayed 4 weeks ago to see the city and go up Machu Pichu. Apparently he bought all the Machu Pichu tickets for the morning he went up so him and his family could be the only ones in the national park for sun rise! Must have been amazing but he´s a bit of a sod because that meant that the everyone who was on the Inca Trek couldn´t get in for sun rise there wasn´t any permits left! I would have been so annoyed! Thankfully Mick Jagger and anyone else famous have now left Cusco so fingers crossed our permits will still be valid for our sun rise ascent into Machu Pichu on M0nday! So we´re off on our trek tomorrow morning, being picked up between 5 and 5.30am so another ridiculously early start but it will be well worth it. I am so excited! We´ve got a pre-briefing with our lead porter this evening where we get to meet the rest of our group. There are 9 of us, all english speaking either from UK, US or Australia, so i´m sure there will be some good banter over the 4 days. I´ll let you know how we get on…Machu Pichu here I come! Food= Afternoon cake at the lovely Chocolate Museum. Drink= Pisco Sour (pisco alcohol, sours and egg whites)- yum! Seen so many I´ve lost count= Vintage VW Beetles in all the different colours of a smarties packet! Big smile moment= Receiving a phone call from Mum and Dad for the first time and hearing I got awarded a distinction for my Masters- woop! So come to Peru, enjoy Arequipa, enjoy Cusco but be prepared for the hassle. I try to tell myself that they are only trying to make a living, and that´s fine, but it doesn´t make it any less annoying! !